I've refreshed my images, so I now have the milestone OSes from "Macintosh System" in 1983/1984 through Mavericks in 2014. 0.95 through 6.0.8L are in Mini vMac with custom 3.2-3.4 builds; 7.0.1• through 8.1 are BII (using IIci or Quadra ROM), 7.5.5 (PPC) and 8.6-9.2.2* are SheepShaver, 10.1.5-10.4.11PPC are PearPC (0.5 and 0.4). The Intel ones not running are all done in VirtualBox. -- this fixes the nvram overwrite issue. My info.plist points to this file instead of the BasiliskII binary in that folder. Sheepshaver uses emendelson's SheepShaver Wrapper, with a few custom tweaks. PearPC uses WineSkin wrappers with native windows (no XWindows). Would it be worth me writing up some walkthroughs, or is anyone even interested? Oh yes, and before anyone asks, that 9.2.2 is 9.0.4 System with the 9.2.2 software and some Resourcerer hackery in the System file. It's discussed in a few other threads on the site. Last edited by Ronald P. Regensburg on Mon Jun 18, 2018 9:00 am, edited 1 time in total. ...That's one hell of a monitor you have there. And a hell of a Mac to run all of that. It would've been nice if you used floppies for the pre-PPC OSes, like how you used CDs for the PPC ones. A walkthrough for this feat? ..Naaah, for me. I'm using computers for the earlier ones as I'm emulating specific computers that were the prime target for the OSes released -- and because I couldn't find scans of the original floppies If you can find 'em, I'll use 'em. Wow this is really great! It might take me a while, but I could probably do this, based on installer image checksum and a search folder (so no custom names needed). There is one drawback: to set things up, I needed to run the base installers, and then run the software update image installers to get each system up to its final state. Apple has since taken the updaters offline, and I'm not sure about the legal implications of making those available with such a product. I guess I could ask someone at Apple if I can get their blessing on that They may just be amenable with their "30 years" thing going on right now. That would be a lot of work if you want to support non-english versions though. But I would love to see this done. Maybe I could have a set of default names and then get people to send me checksums of specific images they want to use. In a related note, I'm starting to put video walkthroughs of the various OSes up on apple.wikia.com. Let me know if there's anything specific you'd like highlighted. I'd like to see a walkthrough, it looks amazing! By the way, I think you should have Rhapsody in your list! And since we have Shoebill now, you could add A/UX too! 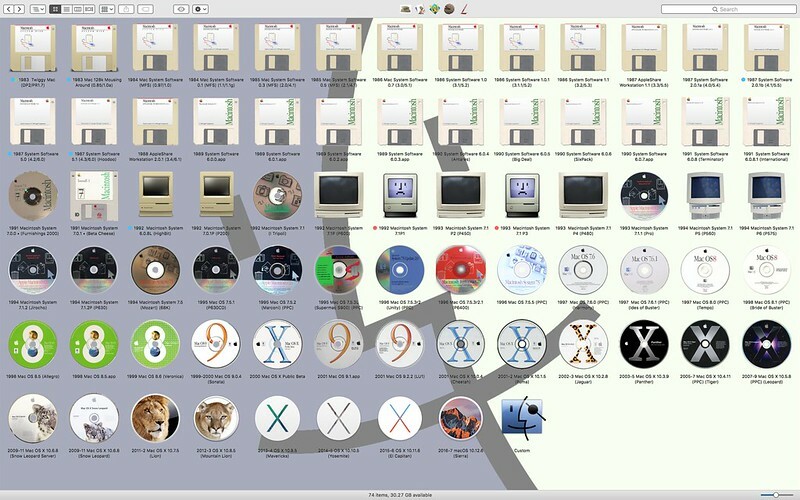 For those icons, the computer ones shamelessly come from Mactracker; the disk image ones I made myself. 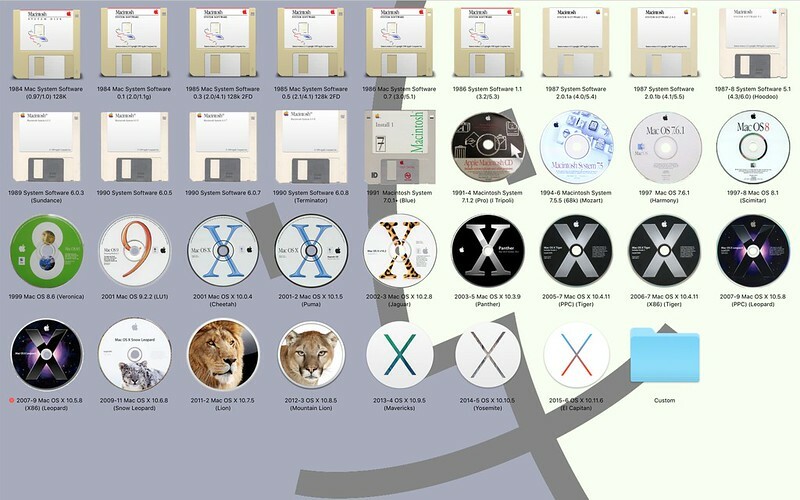 The later ones are taken off of the install DVDs for the OS (Apple hides interesting graphics on their install DVDs). Rhapsody and A/UX were on the list at one point, but I removed them (and Lisa, Apple III, ProDOS, GSOS etc.) because I was biting off too much (it's been too many years already since I started this). Once I get the core Mac OSes done, I'll see about doing the related systems. I've ended up doing Apple I through El Capitan, but it got too big, so my main folder is just consumer releases of the Mac OS now (I've got Twiggy, dev releases, etc. 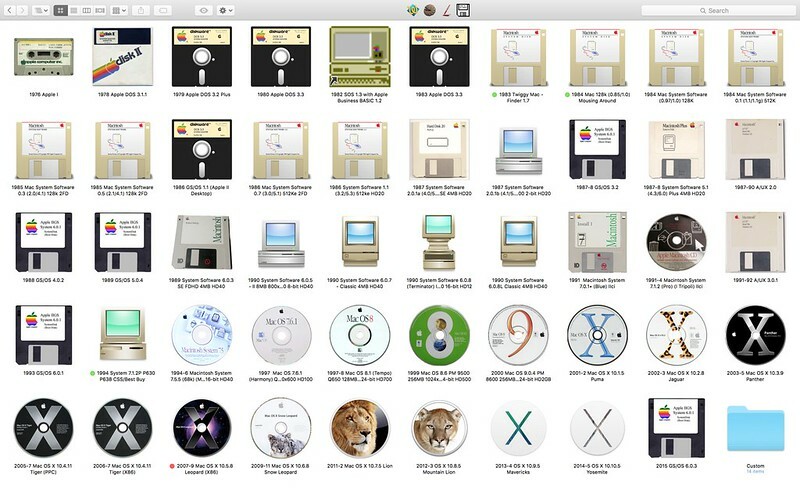 in a different folder, and Apple computers + Lisa in a different folder as well). And yes -- I painstakingly recreated the old Floppy install disks, with some help from a few assets I had already kicking around. 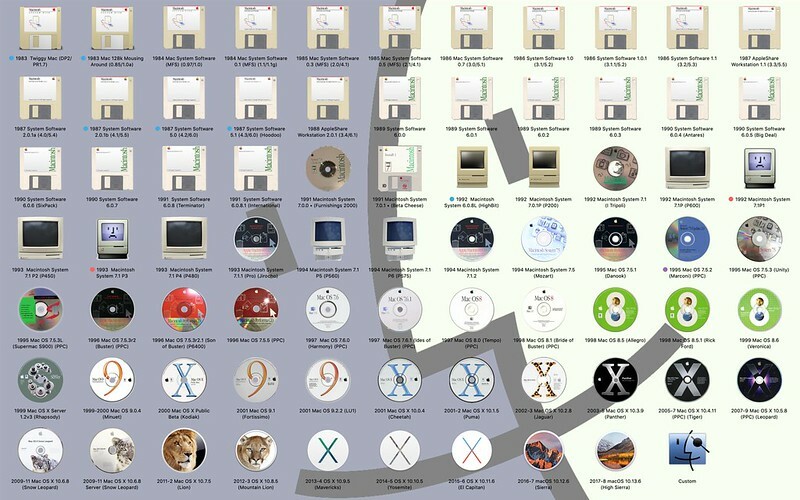 Would you share all the Icons (Floppy, CDs and nonCD-CDs) you used? My VMs all look ugly as hell. Or would you even share the whole thing? That would be really cool. What emulator did you use for os x 10.0? I can't seem to find one that works(I used 10.2 in pearpc to install it, though). What emulator did you use for os x 10.5 powerpc? I have done almost that with windows(up to XP) and mac ( up to 10.4[with an issue with 10.0]). For 10.0 and 10.5, you need to be folllowing the huge qemu thread on here... it now supports Mac OS 9.0.4 through Mac OS X 10.5.8 -- WITH networking via sungem that doesn't require the realtek drivers to be installed. The 2.8wip install from mid-August in the Qemu thread works, but can have some install issues; using the 2.7 final image with the VGA OpenBIOS is probably the best bet for a successful install. For Twiggy through System Software 0.5 I use Mini vMac 128k default build; for System Software 0.7 through 6.0.8 I use Mini vMac II fully loaded (all extra features added); System 7 through 8.1 are currently in Basilisk II, but I'm finding they need to be on thousands of colors to be usable, and BII keeps resetting to millions of colors after each reboot -- and even at thousands, they seem a LOT slower than they used to be 8 years ago on much slower hardware; not sure what's going on there. Mac OS 8.6 is using SheepShaver. I'm considering doing PPC versions of 7.1.2 through 8.1 as well, as SS is still quick, unlike BII. As I said, Mac OS 9 and up on PPC are done via Qemu. The x86 stuff is all done in VirtualBox (you'll need VirtualBox 4.3.6 or earlier to actually create your VMs for 10.4 and 10.5, and 10.5 won't even run for me on anything above 4.12 -- and my current OS requires VBox 5 or later). For the Apple I I use OpenEmulator, I also use it for Apple DOS 3.1 - 3.3. Apple ][ Desktop through GSOS 6.0.3 (you heard that right -- .2 and .3 came out last year!) are done through Sweet 16. 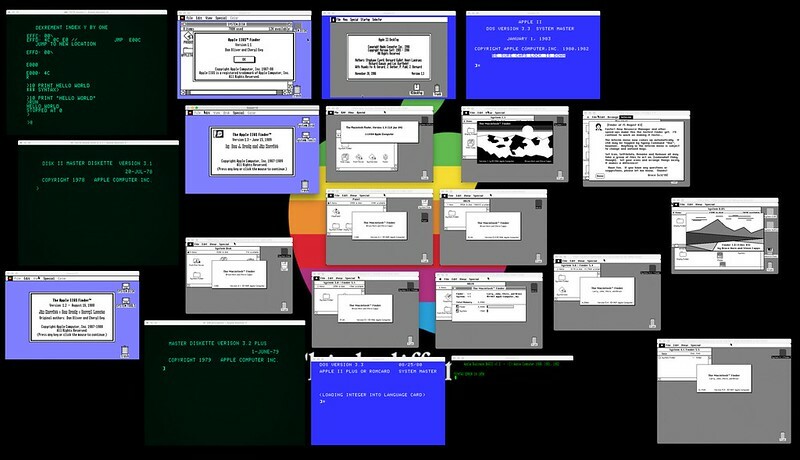 LisaEm is used for Lisa OS, SOS 1.3 (For the Apple III) is done through Sara, and ShoeBill is used for A/UX 2.0 and 3.1. 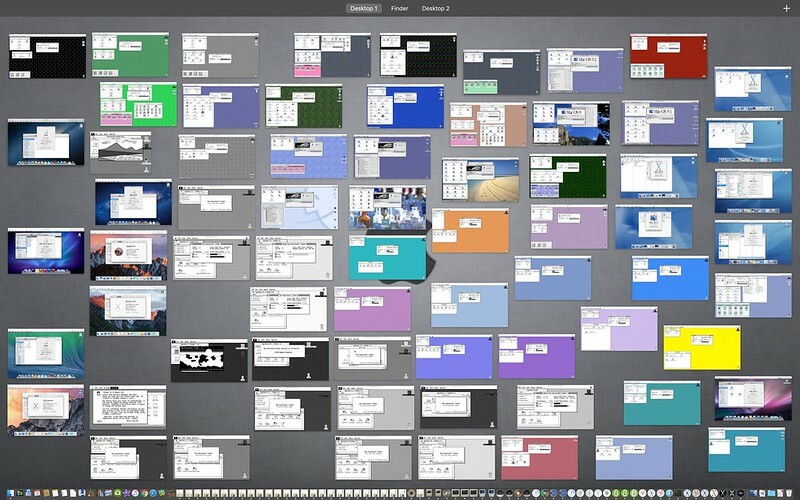 I used PCE for system 1 through system 6, sheepshaver for os 7 through os 9, and pearpc for os x 10.1 through 10.4. Sheepshaver with jit enabled is fairly quick for os 7 and os 8, for some reason, os 9 is slower than os 7 and os 8, especially shutting down. Sheepshaver without jit is slow, but only required on windows. Pearpc is faster than qemu, but it can't run os x 10.0 or os x 10.5. Interestingly, for many operations, qemu is now just as fast as PearPC. I used to use Windows PearPC with JIT via WineSkin on OS X, and it was just as fast as on Windows -- qemu is much faster than non-JIT PearPC. Also: PCE is Mac Plus only, whereas using Mini vMac with the Mac II ROM allows you to do arbitrary screen resolutions and works all the way back to System 2.0/Finder 4.1. It starts supporting colour at System 2.01b (S4.1/F5.5). It's definitely an odd experience using System 2.01b in 1280x720 with 256 colours, but it works! SheepShaver only supports down to System 7.5, as it doesn't support the only PPC architectures supported by 7.1.2. I suppose if someone hacked a system enabler for later PPCs than the original *100 series, it might make SS work, but right now it just locks on boot. SheepShaver is significantly faster than Qemu still on OS 9; this is mostly due to Qelmu having extremely poor FPU emulation. That might be fixed in the next year However, SS only goes to 9.0.4, and Qemu can emulate 9.2.2 which has a number of stability and speed improvements over 9.0.4 -- so Qemu running 9.2.2 isn't all that much slower than 9.0.4 running on SheepShaver. Of course, sound is also really slow still on Qemu (when it works), so if you're wanting to do something audio related, SS is still the way to go. And Qemu can't do 8.6 yet, let alone earlier PPC systems -- it only emulates as low as a G3, and most of the recent work has gone into improving the G4 architecture. 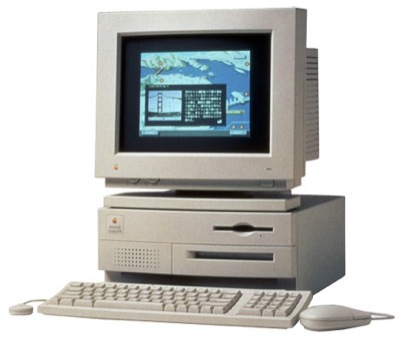 The reason that I'm using PCE is that it supports the Macintosh classic on down to the 128k Macintosh. Mini vMac might have better emulation of later systems, but once you get to 7.x, it's better to use Basilisk II. QEMU support is still iffy, but it's better than PearPC for 10.0 and 10.5 PowerPC. I'll have to try OS 9 in qemu. Mini vMac also supports 128k through Mac II systems (see the variations page), and does a better job these days than BII for Mac II emulation. BII is still the only game in town for Quadra emulation, and provides Ethernet support that Mini vMac lacks. The main iffy support on qemu appears to be in the FPU emulation. Once that gets fixed, the usb audio driver might actually stabilize and be usable for audio out on OS 9 through 10.3 (it doesn't work as a universal driver on 10.4 and 10.5 for some reason -- they require you to actually have a USB audio device plugged in). Mini vMac variations work well, but aren't official. Mini vMac works for system 1-6, but you have to drag and drop(there is no way to double click to run a virtual machine), but PCE uses configuration files. OS X 10.4 and 10.5 USB audio devices can be emulated on qemu can't they? Mini vMac variations work well, but aren't official. Mini vMac works for system 1-6, but you have to drag and drop(there is no way to double click to run a virtual machine), but PCE uses configuration files. Mini vMac variations are official. It's the official variations service; you can download whatever variation you need. Mini vMac works by compiling a binary with custom PRAM values instead of having a preference setting after the fact. The default Mac Plus is only the default. You do not need to drag and drop for Mini vMac; if a file called disk1.dsk is found in the same folder as the executable, it will be auto-loaded. This goes from disk1 to diskn, where n is the maximum number of simultaneous disks you've set as the maximum in your build of Mini vMac (hard ceiling is 32). It will only load up until it doesn't find a number, so if you have disk1, disk2, disk3, disk5... only the first 3 will auto-load. On OS X host, you can also drop a mnvm_dat folder inside the application's contents folder, and toss your disk images and ROM inside there. This location is treated just like the folder Mini vMac is in. So with Mini vMac, instead of fiddling with a prefs file, you set it all on the website in the variations area, and download a unique executable for each combination of settings you want to use. Toss the executable in a folder with the ROM and disk images you want to use, and then create a shortcut to the executable elsewhere. Mini vMac can also take images as command line arguments, which can be embedded in the shortcut, but that's not really needed since an easier method is already available. I haven't tested it on Windows with shortcuts, but on OS X with aliases, the ROM and disk image files located in the folder with the executable can be aliases, not the original files. This might not work with Windows, due to the shortcuts having the wrong file extension. However, with Windows 10, you can also use symbolic links instead of shortcuts; those should work in the same way. OS X 10.4 and 10.5 USB audio devices can be emulated on qemu can't they? For Pre-OS X 10.4, the USB audio device driver will output to whatever the host's default audio out happens to be. For 10.4 and 10.5, the driver enables the guest OS to connect to USB audio devices on the host. Non USB audio devices won't play the audio. I think this is due to the fact that 10.4 and 10.5 actually recognize USB audio as addressable serial devices, whereas earlier versions just see the driver as an audio output device. I'm shuffling things around so that I can share my entire setup without having non-distributable assets (the classic ROM images and the more modern OS installs) actually come along for the ride; all DND bits will be aliased to another folder, which should make management of the images and ROMs somewhat easier actually. Here's the latest variation... I've added in a few. Haven't got any further on automating the setup process, sadly. Since then I've also added OS X Server 1.2. Last edited by Ronald P. Regensburg on Sun Jun 17, 2018 7:09 am, edited 2 times in total. I've finally upgraded all the underlying emulators to 64-bit latest versions, and I've even got OS X Server 1.2v3 booting in 1280x720 (both the server AND OS X 8.6). Still looking for System 7.1P1 and 7.1P3, unfortunately. To make that work, I need either Apple Backup disk images from the Performas that ran those versions, or just a Stuffit archive of their system folders.